Maison Cote Est European art and style is not something that is the same across the entire continent; French style is different from Spanish style, Polish style is different from Italian style, and so forth. 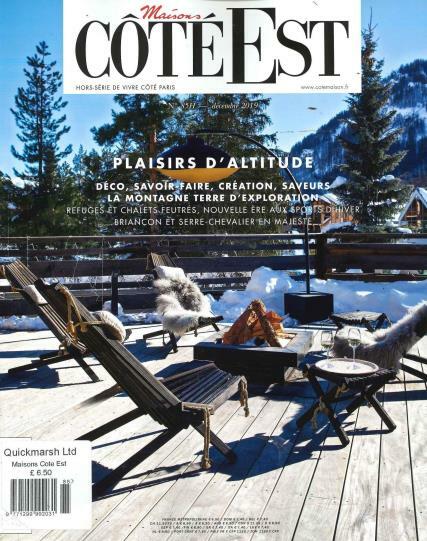 Buy a single copy or subscription to Maison Cote Est magazine. With Maison Cote Est, one of the most beloved art magazines, you will be given an inside look into the wonderfully artful world of Central Europe. Covering local cuisine, culture, interior design, and craftsmanship from Eastern France to Western Russian, you will be taken into a world that is packed with exquisite beauty and humble living. Discover beautiful decorations and find the inspiration that only parts of central Europe can have, while turning your own home into a unique work of art. It is definitely not only an interior design magazine, as a major attraction to this lively publication is the way in which in brings to you hundreds of different foods and recipes from France, Venice, Russia, and many other places in Europe. Show your friends your newfound love in gastronomy as you broaden your food knowledge and cooking capabilities. All of the foods are presented with easy-to-follow recipes and background information about where it came from and how it relates to the local culture.